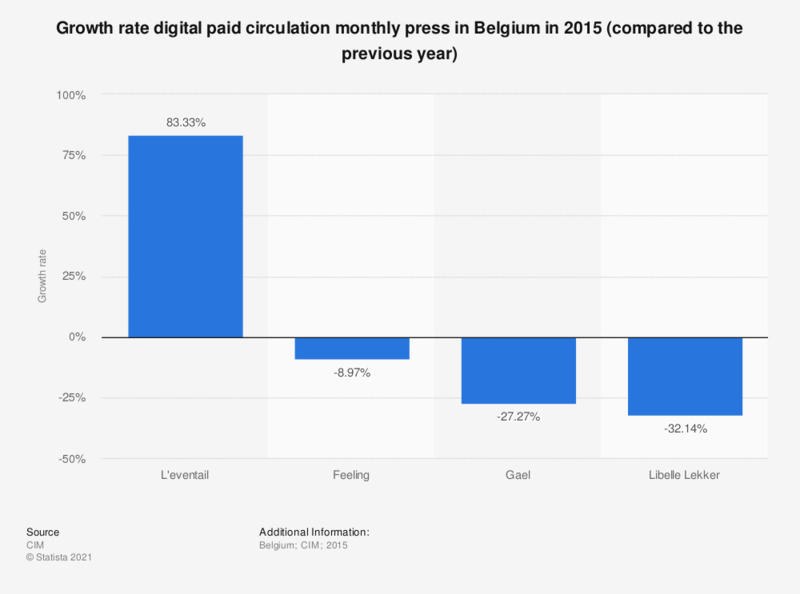 The statistic displayed above shows the growth rate of the digital paid circulation of the monthly published press in Belgium in 2015. In 2015, L'eventail had the largest growth in digital paid circulation with 83.33 percent more than in 2014. The Center for Information on Media (CIM) has two different kinds of studies on press figures. The figures represented in the statistic above are from the authentication document published quarterly by CIM. Every quarter publishers fill out a declaration on the circulation of the magazine/newspaper. After every year, the declared numbers are checked by an audit bureau (MICC in this case). When the audit bureau decides the declared numbers are correct the publisher can use the CIM control label.